Jim Moir grew up in Darlington. After stints as a pig farmer and factory inspector, he moved to London. As well as performing in bands, he also joined the alternative comedy circuit. The name Vic Reeves reportedly came from his favourite singers Vic Damone and Jim Reeves. 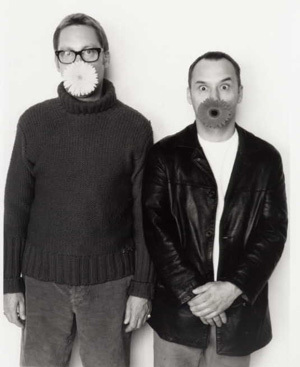 Vic Reeves Big Night Out began life as a regular Thursday night gig at Goldsmiths Tavern. Here he met Bob Mortimer, who soon joined the show, and his growing TV profile led to the Big Night Out getting a slot on the small screen. A small cult following soon became a phenomenon, and cries of 'You wouldnt let it lie!' were heard across the nation. Of Reeves And Mortimer), and turn the game show format on its head (Shooting Stars) with their surreal take on the world. Bob Mortimer studied law, and was working in London as a solicitor when twist of fate delivered him at comedys door. He was a regular audience member of Vic Reeves Big Night Out, and one of the few to be promoted from drinking pal to performer. Bob created many characters including The Man with the Stick and Judge Nutmeg. phenomenon, and cries of 'you wouldnt let it lie!' were heard across the nation. Of Reeves And Mortimer), and redefine the game show (Shooting Stars) with their surreal take on the world. Bob is a Middlesborough FC supporter, and lost a tooth when a rival fan lobbed a can at him.